Built by Samhongsa in South Korea, this Union Pacific prototype was among the last brass models imported by Alco Models. This 1982 HO-scale release represents a rebuilding program undertaken by UP in the late 1970s to recycle its SW7, SW9, and TR5 switchers. Diesel Era covers the program's history and documents the output of 75 examples of SW10s produced from 1979 to 1984 in its Volume 6, Number 3 edition from May/June 1995. Found working in Peoria, Illinois in the spring of 2012 is former Union Pacific SW10 #1258. 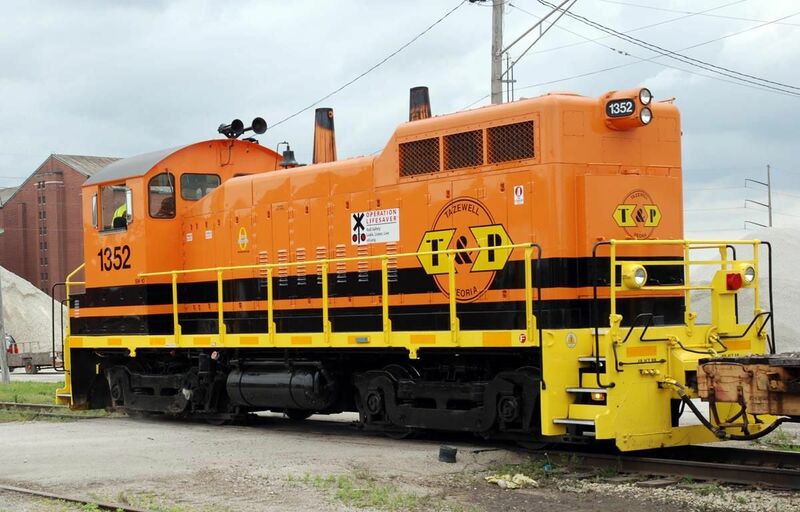 This switcher began life as a UP SW9 #1829 and was rebuilt in 1983 by Union Pacific during its SW10 program. Wearing orange with black stripes and yellow sill and pilots, this SW10 is shown working the Tazewell & Peoria as its #1352 in this Tony Cook photo.